I read this article and found it very interesting, thought it might be something for you. The article is called The 15 Most Amazing Ski Lifts in The Worldand is located athttp://welove2ski.com/where-to-ski/ski-lifts. Ochsenstäfeli-Muttsee materials lift. Photo: © Doppelmayr. From a double-decker lift that floats over a mile-high gorge and a 17mph drag-lift for five, to a cabin that revolves through 360 degrees – we have collected together some of the world’s highest, longest, scariest and above all most amazing ski lifts. Many of them are mind-blowing feats of engineering. Some of these systems are not just capable of carrying passengers, but also machinery, bulky materials, cars, trucks and even piste-machines. Gorges and valleys, rivers and lakes, roads and forests present no problem at all to the past and current generation of daring lift engineers. The Mont Blanc Skyway has now been completed above Courmayeur, travelling up to Pointe Helbronner and replacing the old cableways. The new triple-stage lift has been constructed mainly from steel and glass, with rotating spherical glass cable-cars offering skiers a 360° view of the whole area. At Pointe Helbronner, 3452m above sea level, a round terrace of 14 metres diameter also allows a 360° view of Mont Blanc’s peak at 4810m, of the Dent du Géant and the Vallée Blanche. The double-decker lift floats over a mile-high gorge and in December 2013 two slack-wire walkers cavorted between the two cars. Paradiski is the name of the joint ski area created by the Vanoise Express between La Plagne and Les Arcs. However, most skiers in one or other resort only cross over once during a week’s holiday, since both resorts have lots of their own skiing. The lift can get crowded, too – especially mid-week. The four famous Va et Vient (‘Come and Go’) lifts are multiple-person drags that access steep avalanche-prone slopes. They slingshot you up the mountain and provide access to avalanche-prone terrain. After an avalanche they simply dig out the wires, flatten the debris, and the lift is back in business. The biggest – Roca Jack – takes five skiers, standing side by side as they are hauled up the mountain on a sort of giant T-bar at a knee-jerking 17mph – it’s a bit like skiing uphill! Portillo in Chile is famous for its off-piste skiing and a policy of selling only 450 lift tickets a day, which is how many guest beds there are in the resort. The Funitel Galzigbahn in St Anton is designed a bit like a fairground big wheel. You enter one of the 28 gondolas on the ground floor and then rotate to the top of the wheel to start moving up the mountain. The building is floodlit by night and looks more like an avant-garde art gallery than a lift station. The small isolated hill-village is situated in the northern Indian state of Jammu and Kashmir at the western extremity of the Himalayas and 35 miles from Srinagar, the state capital. The area is close to the disputed Pakistan-India border so there’s a constant military presence. That apart, Gulmarg has the world’s highest gondola, which was installed in 2005. It accesses the ski area from the resort up to almost 4000m and offers over 2200m of vertical descent, with views of K2. The resort is growing fast and is opening more lifts and terrain with the aim of becoming India’s first fully-fledged ski resort with international appeal. The gondolas linking Whistler and Blackcomb mountains in British Columbia speed over nearly two miles of unsupported cable. Some of them have glass bottoms, so if you are lucky enough to step into one of those the view down 1,430 feet (436m) to the valley floor is pretty exciting. An unexpected number of single chair-lifts still exist – most of them in Japan, Eastern Europe and Germany. This one in Niseko is old, has no safety bar and not much in the way of back support either. As you can see, it’s a lonely ride up. Skiing on Japan’s northernmost island of Hokkaido is unlike anything you will have ever experienced before. You ski through stands of bamboo, eat noodles and sushi in the mountain restaurants, and bathe in public onsen after skiing. The resort is one of the snowiest you’ll find anywhere, with an average season cover of 15.11 meters – and it seems to snow almost every day in winter. The Japanese mainly stick to the pistes, leaving the seemingly bottomless powder untouched. The twin cable-cars from Chamonix were originally built in 1950 and 1955 but received a major overhaul in 1990. Passengers are whisked to the top of some of the most extreme lift-accessed terrain in the world and, after riding two cable-cars for 20 minutes, you are dropped at 3842m with views from France across to Italy and Switzerland. Step Into The Void opened in December 2013 – it’s a technological masterpiece where, from the terrace at 3842m, you stand inside a glass box with more than a thousand metres of nothingness under your feet. Not for vertigo suffers. There’s no easy way down from the Jackson Hole tram. Once you’re riding the lift that’s it – and a loud speaker message on the way up tells you so in no uncertain terms. If, at the top, you don’t like what you see, get back in the cable-car and ride it down. “The JH tram is surely the king of them all with a huge and charismatic aura,” says mountain connoisseur Arnie Wilson who has skied in 729 resorts and been to Jackson 26 times, “the others don’t have anything like the same mystique”. Penken Combibahn. Photo: © Doppelmayr. A chondola is a mix of gondolas and chair-lifts all on one cableway, so you can take your pick of how to ascend the mountain – weather depending. The biggest chondolas include those in Mayrhofen, Alpe d’Huez, Are in Sweden, Kaprun, Lech, and Obertauern. Mayrhofen’s chondola seats eight on the chair and ten in the gondola. The highest chair-lift in the northern hemisphere rises to 12,840ft (3914m) and opened up about 400 acres above tree-line on Breckenridge‘s Peak 8, which you previously had to hike up for around 45 minutes. From the top of the chair you feel like you’re at the top of the world, with views of Breckenridge town, Baldy Mountain, Quandary Peak, Lake Dillon and Keystone Resort. Rotair Engelberg. Photo: © TVB Engelberg/Swiss-image.ch. 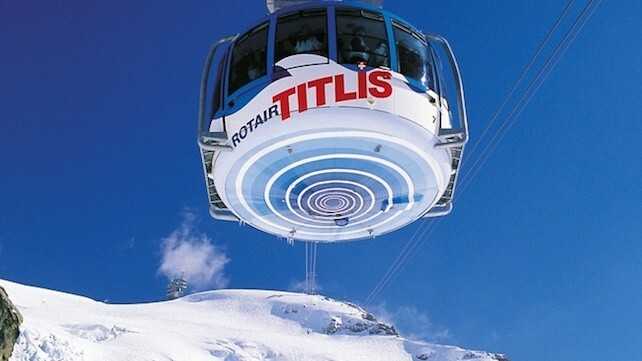 Titlis Rotair in Engelberg was the first revolving aerial cable-car in the world. It rotates its way from the middle station at Stand up to the mountain summit at 3020m. On the five-minute journey the floor of the gondola revolves 360 degrees, treating you to panoramic views of steep rock faces, crevasses and distant mountain peaks. New cabins were introduced in winter 2014-15, which revolve completely. Also known as The Up-and-Over, the lift goes up and down both sides of the high ridge separating the Solaise and Le Fornet sectors of the ski area…some people find this chair-lift in Val d’Isere scary, while others just admire the view. Frightening or not, what everyone shares is that feeling of having left your stomach somewhere else as you drop over the top of the mountain. Ski bums have been known to risk life and limb by jumping off at the top and skiing down the far side. The Grimentz-Zinal cable-car. Photo: © OT Sierre-Anniviers. It looks a bit like the Jackson Hole Tram and opened in 2014 when the ski areas of the small but sweet Val d’Anniviers resorts of Grimentz and Zinal were finally linked. The base of the cable-car has a window in it so you can see the forest, the cliffs and the chamois from above. Is this the world’s cosiest cable-car? In 2014, the 3-S Pardatschgratbahn A3 became the first cable-car to open with all its seats heated for the entire journey up and down the mountain. Killington in Vermont has eight-person gondolas with heated benches. Chair-lifts have so far only had their seats heated whilst in the valley station. …and this one includes the Galzigbahn in St Anton, ad the Vanoise Express in Paradiski, and some unique footage of chair-lifts being destroyed! Are there any lifts you think should be added to our list? If so, let us know in the comments box below. For further information on the world’s ski lifts you can also visit Lift World. I don’t know if you still can, but on the Dachsteiner Gletscherbahn in Salzburgerland, you could ride on top of the gondola. Nordwand chairlift in Kleineshidegg should be on the list! right below the North face of the Eiger, stunning! sounds like it must have a great view Sarah! That’s interesting Biba, I didn’t know about that lift in Georgia. I will look it up! Perhaps the longest ski lift in the world is on Mount Tochal above Tehran!! I rode the Hokaido one with no back and safety bar when I was 10! It was pretty scary! You were about 50 feet above the ground also!.!. Hi Alex, it was scary enough for adults…terrifying for a young child!